I should preface this entry by acknowledging that it is probably influenced by a pretty heavy dose of cabin fever. It is 9:45 am by my watch, about 4:30am Moscow time and somewhere in between for local time. Goodness knows what time the train is running on- Moscow time sort of, (but it in no way corresponds with daylight hours) and, if so, I have no idea when to expect the one meal a day that we are provided with (which was a pleasant surprise to us); dinner time on the first day and morning tea time on the second. I’m sure it will be completely different again today, the general rule seems to be that it will turn up just after you have stuffed yourself to the brim with two minute noodles. The other exciting development of the time difference is that our 53 hour train journey may be a full 5 hours longer! Roomies Overall the journey so far has been pretty good and our cabin mates till now, Lena (who got off at about 3:00am this morning in Novosibirsk), a man who wasn’t interested in giving his name (but is travelling to Moscow), and Lena’s replacement (who snuck in sometime during the night) have all been pretty good in the grand scheme of things. They’re not smugglers, they seem to have an appropriate grasp of personal space and general hygiene is not a problem. However, after so many hours and in such small quarters, certain eccentricities are beginning to grate. The biggest two both concern light. The first issue is that Mr Moscow, my fellow top bunker, does not seem to like reading just by the reading light and prefers instead to leave the full cabin light on until all hours of the morning regardless of the fact that everyone else is sleeping, and for me this requires throwing a towel over my head. Hot, bright and unhappy. After basking in the full exposure of two full neons until after midnight, I was looking forward to some bat cave style darkness. However, our newest cabin mate also appears to have a dark phobia and insisted on leaving the cabin door partially open all night. Attempts to shut it were quickly countered… so no restful darkness for us! The landscape is stunning. Quite a few towns, which I guess should be expected since Siberia or not, we are travelling on a major rail line. For the most part it is Siberian taiga; small hills, frozen rivers and snowy pine and silver birch forest. Exercise Not much to be had. I set the lofty goal of a full five double unders in a cheeky five minutes spare at a leg stretch stop. I got a full 3 out, lots of messy singles and a few weird looks. In my defence, it was very icy, I was wearing a lot of clothes… and I am not very good! 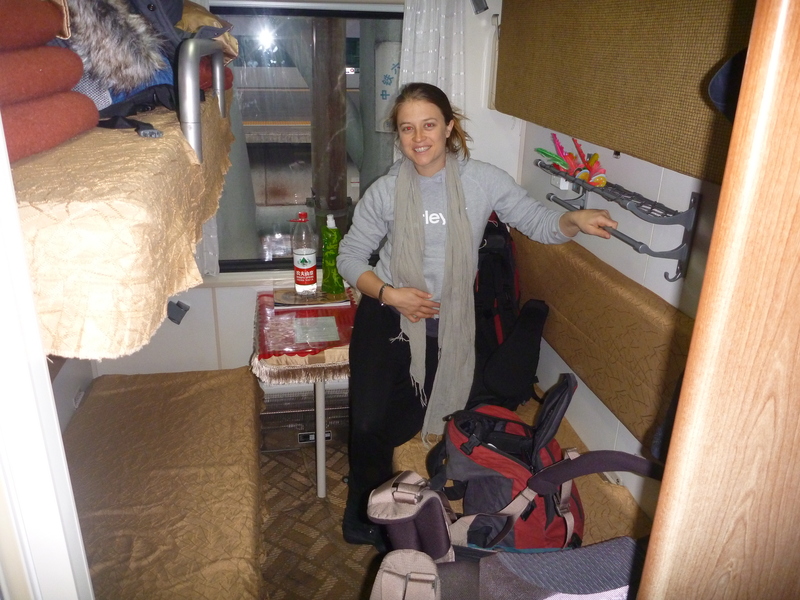 Also discovered that you can squeeze in a few knees to chest by hanging off the top bunks when your cabin mates are out. Leisure When we’re not sleeping, a big chunk of the time is spent watching movies, reading or playing cards. I have reconfirmed that Diamonds Are Forever is the worst James Bond movie pre-Dalton, once the computer has charged (out here in the hallway where I am typing) we might try and find a Bond movie that indulges in some good old fashioned Soviet paranoia as befits a Siberian rail trip! Have been ploughing through books; the Kindle is the best invention ever for travelling. Have learned all about entrepreneurial thinking in Things I Wish I Knew When I was Twenty and have remembered that the broad summary of Twenty Thousand Leagues Under the Sea is much more exciting than actually wading through an entire novel in which the protagonist is a smarmy, self righteous upper middle class white man with no personality. I finished Theories of International Politics and Zombies which is analyses how different political schools of thought may respond to a zombie outbreak. Full of politics geek humour… worth the read!!! I was disappointed by The Politics of Star Trek which promised to be more highly entertaining political nerd fodder but turned out the be a veiled attempt to rehabilitate the image of conservatives. Under an entertaining premise, its main agenda was to draw tangential conclusions that suggest that liberal thinking actually leads to right wing results whereas conservative thinking is the most open minded egalitarian and accepting political paradigm to live by. Fortunately it was very short piece of propaganda to read through (and only about $3 to download). Hoping that Song of the Quarkbeast will see me through to the end of the trip with my sanity intact! This entry was posted in Matryoshka, White Christmas and Reindeer Burgers, Travel and tagged Russia, train travel, Trans Siberian, Trans-Mongolian. Bookmark the permalink.